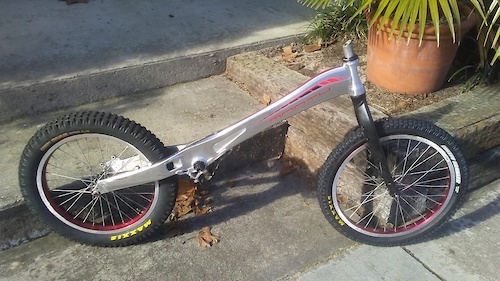 Posted in "2008, 2011 Trek Fuel rear swingarm compatibility"
Vintage Monty X-lite Mod Wheelset 19"/20"
Vintage/Classic Monty X-lite Wheelset Quando Hubs From my 2001 Monty X-lite 19" Rear with decent Monty Biketrial tire, narrow Monty Hub spacing....seems like 120mm ish. (116mm maybe?) missing bearing retainer sleeves..easy enough to replace 20" Front, Radial Laced Ground a few times, but lots of sidewall left.